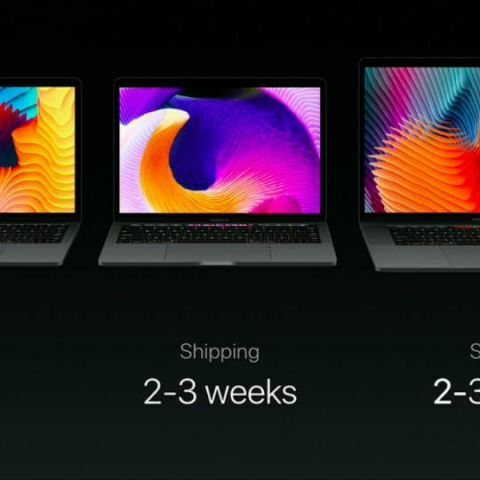 The new MacBook Pros will start shipping in the U.S. within 2 to 3 weeks. Apple has redesigned the MacBook Pros in a new yet familiar aluminium shell, making them thinner and lighter than their predecessor. It's needless to say that the new MacBook Pros are more powerful than before. 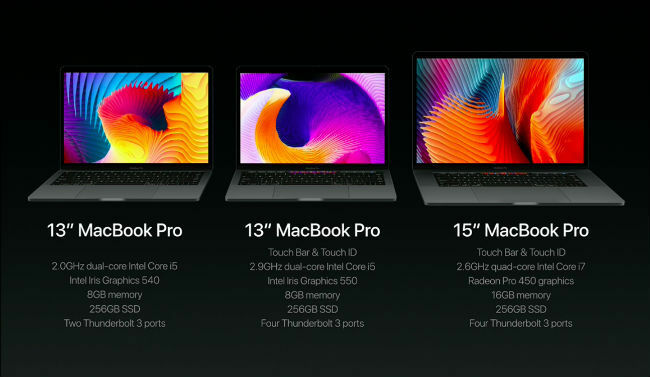 Kicking things off with the specifications, the new MacBook Pros will be available in 13-inch and 15-inch variants. There will be two 13-inch variants. One with the newly announced touch bar that replaces the function keys and one that retains the function keys. The entry level 13-inch Pro starts with a 2GHz dual-core Intel core i5 processor (6th gen), Intel Iris Graphics 540, 8GB RAM, 256GB SSD storage and two USB Type-C thunderbolt 3.0 ports. 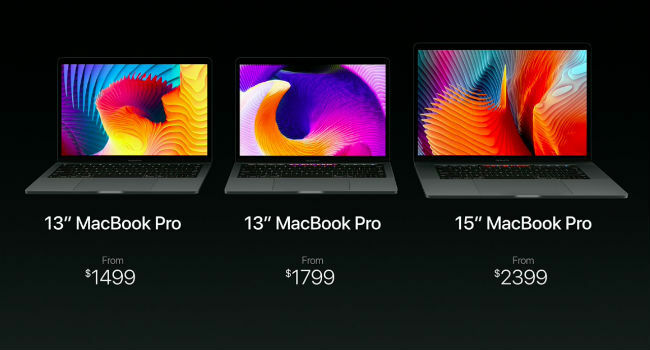 This 13-inch version is priced at $1499 (Rs. 1,00,000 approx. directly converted). Moving on to the 13-inch variant with the Touch bar and Touch ID; it has a 2.9GHz dual-core Intel core i5 processor (6th gen), Intel Iris Graphics 550, 8GB RAM, 256GB SSD storage and four USB Type-C thunderbolt 3.0 ports. This version is priced at $1799 (Rs. 1,20,000 approx. directly converted). Moving on to the 15-inch MacBook Pro, the device has the Touch Bar and Touch ID. It is powered by a 2.6 GHz quad-core Intel core i7 processor (6th gen), Radeon Pro 450 graphics, 16GB RAM, 256GB SSD storage and four USB Type-C thunderbolts 3.0 ports. This 15-inch MacBook Pro is priced at $2399 (Rs. 1,60,000 approx. directly converted). All three configurations mentioned above are the entry level configurations. All of the new MacBooks boast of a headphones jack, in case you were wondering. Apple claims that the new 13-inch MacBook Pro is 14.9mm thin, making it 17% thinner and 23% smaller when compared to the previous generation 13-inch Pro. Moving on to the 15-inch Pro, Apple claims that this one is 15mm thin making it 14% thinner and 20% smaller when compared to the previous generation 15-inch Pro. The trackpad on the MacBooks has been upgraded too. All the Pros now boasts of the force touch trackpad. The trackpad on the new MacBook Pros is also twice as big compared to the previous generation trackpad. The keyboard on the new machines is the second generation butterfly mechanism. We saw the first generation mechanism when Apple introduced the MacBook. The Touch ID on the MacBook Pro is integrated into the power button and will work with Apple Pay. The Apple T1 chip powers Touch ID on the MacBook Pro. Touch ID can be used to work with Apple Pay in the same way it works on the iPhone. Touch ID also helps log in multiple users, which is a cool new addition. Coming to the displays on the new MacBook Pros, they are 67% brighter, offer 67% better contrast, with a 25% better colour gamut when compared to the previous generation Pros. As always, Apple claims that the devices will have up to 10 hour battery life which we would like to put to the test when we get our hands on the laptops. The other thing Apple spoke of at the event was the Apple TV. Apple announced that the Apple TV has more than 8000 apps and more than 2000 games for users to take advantage of. Apple also announced that Minecraft would be coming to the Apple TV. Another major announcement was the TV app for the Apple TV. Put simply, the TV app houses content from all video streaming apps under one roof. At the event Apple demoed this with apps such as CBS, ABC and more but there was no mention of Netflix being a part of this TV ecosystem. We will have to wait and see if India specific apps such as Hotstar, Spuul and more become a part of the TV app on the Apple TV. The TV app will launch for the Apple TV in December 2016. Another fun fact for you Apple Fans. October 2016 marks the 25-year anniversary of the Apple Notebook. Apple unveiled their first PowerBook 25 years ago. In October, Apple also celebrated 15 years of the iPod. What do you think of the New MacBook Pros? Are you tempted to get one? Is the new Touch Bar the revolution we needed in portable notebooks? Let us know in the comments section below.